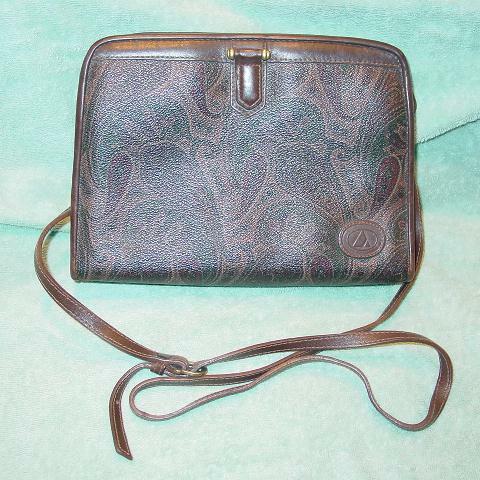 This vintage purse has a paisley design in light brown, red, and green and a genuine brown leather trim. It has a 49" long shoulder strap and brass-tone horseshoe shaped buckle. It has an outer back open pocket and 3 interior sections. The center section has a top side to side zipper and there are two open sections, one on each side of the center one. 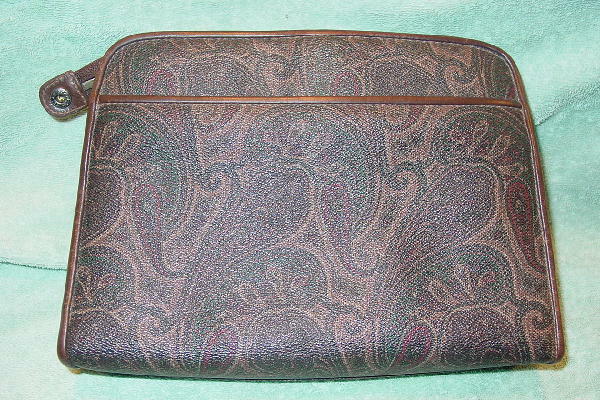 It has a light tan fabric lining and the center section has an interior zippered compartment. The center section has a couple of red makeup marks. The brown leather trim has some scuff marks. It's from a former model who sold her Liz Claiborne purse collection when she got a divorce.